Panasonic’s Optiflow canister vacuum. The Panasonic OptiFlow MC-CG917 canister has Optiflow technology which helps to maintain a consistent volume of airflow through the dust bag, even as it becomes full. This model has a larger dust bag than the model it replaces. With its strong suction and tools, the MC-CG917 OptiFlow is ideal for removing pet hair. A 14-inch cleaning path allows you to clean larger areas in less time. EZ Bare Floor Option: An easy to access switch on the nozzle shuts off the agitator for safe bare floor cleaning. Dual Motor System: The motorized nozzle allows for gentler and more effective carpet cleaning. A convenient switch on the nozzle shuts off the agitator for safe bare floor cleaning. Included Tools: Crevice Tool, Floor Brush, Dusting and Upholstery Brush. 4 position carpet height adjustment (XLO, LO, MED, HI). 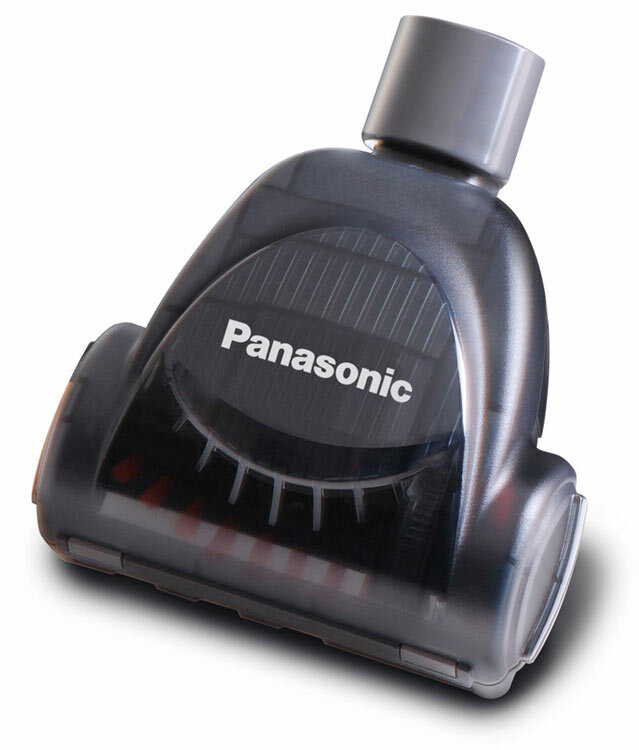 This version is Panasonic’s is suitable for pet hair removal. This vacuum received the Good Housekeeping seal of approval. The MC-CG917 OptiFlow version includes an air-driven Air Turbine Brush Tool to clean upholstery, cars, and stairs of dust, dirt, and pet hair. The Panasonic MC-CG917 has an ergonomic handle for easy vacuuming, as well as a wand which allows you to reach for stairs, drapes, upholstery, and more. HEPA filtration prevents dust and dirt from polluting the air while you are vacuuming. Its 24 foot power cord is longer than most canisters. Automatic Cord Rewind: A rewind mechanism reels up the power cord with a press of a button. The 360-degree hose allows you to maneuver the hose in all directions, without getting the hose twisted. MC-CG917 Vacuum Cord Length: 24 feet. Vacuum Warranty: 1 year parts and labor. 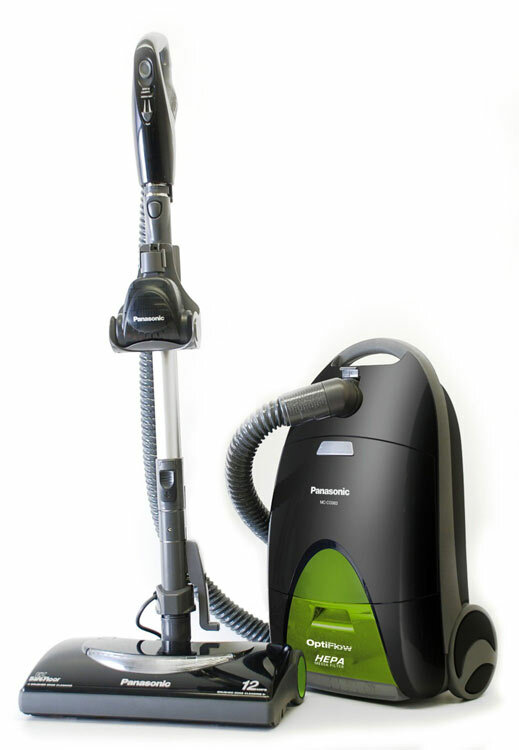 Smart-Review Commentary: The Panasonic MC-CG917 OptiFlow is one of Panasonic’s best canister vacuums with the power and tools to tackle pet hair. Panasonic Optiflow technology maintains a consistent airflow through the dust bag, even as it becomes full. The Hepa Filter and allergen Bag filters capture microscopic pollen, mold, and bacteria. The dual motor system provides the brush head with the ability to better clean rugs and carpets. You can use the included Air Turbine Tool to remove dirt and pet hair from smaller areas, such as stairs, inside your car, and furniture. The large C-5 vacuum bags are micro-lined to trap allergens, trapping particles as small as 3 microns. The 360-degree swivel hose allows you to better maneuver the hose in any direction without it getting twisted. Automatic cord rewind for convenience. The wand and hose give you a long reach to clean stairs, walls, drapes, and ceilings. Reviewers have reported this model is excellent for pet hair removal. This model has received outstanding reviews by consumers. This model is a Smart-Review top pick in the bagged canister vacuum category.